Just a reminder that the Wednesday ice will switch starting on Wednesday January 9th. This Saturday Dec 22nd, you are invited to join us for our Mini Meet and Games Day. It’s a fun time to socialize with the entire club and skate to our hearts content! The Mini meet and fun day, starts at 7:00, not at 7:30 as previously posted. The post and schedule page have been corrected. Here are the changes to the standard schedule over the Christmas season. Saturday Dec 22nd: Club mini-meet and fun day. Ice time is 7:00 am – noon. Details to follow. Sunday Dec 23rd: Normal ice time, normal groupings. Tuesday Dec 25th: Ice cancelled. 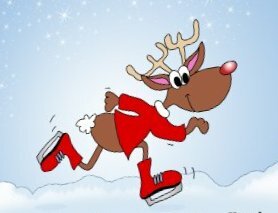 Wednesday Dec 26th: Ice cancelled. Sunday Dec 30th: Ice cancelled. Tuesday Jan 1st: Ice cancelled. Wednesday Jan 2nd: Ice cancelled. Sunday Jan 6th: Normal ice time, normal groupings. These changes have also been added to the Practice Schedule page. The schedule page has been updated to clarify session times – including ice flood times. At the discretion of the coaches, the ice may be flooded between sessions. They will do their best to split the flood time evenly between the two sessions. Skaters on the second hour should be ready to go on the ice before the scheduled end of the previous session. This gives the coaches the opportunity to involve them in activities at the end of the first session, and ensures sure we don’t loose any time between sessions. Here is a copy of the updated schedule. The most up to date version is always on the schedule page.